The name “tobruk” comes from the Libyan city of the same name which was besieged by the Afrika Corps under General Rommel. During the siege, soldiers from both sides were entrenched in foxholes to protect their positions. The tobruks form part of what is known as “the Atlantic Wall”, which is not a wall at all but rather a line of defences built by the TODT organisation from 1942 onwards. These defences were designed to protect the coasts of countries occupied by the Germans from an Allied invasion. The Atlantic Wall consists of large-scale defences – both bunkers and smaller defensive structures such as the tobruks. The small, circular, reinforced concrete bunker known as a tobruk was designed for one soldier, usually armed with a machine gun. Tobruks were shelters with an opening at the top. The opening gave the soldier partial protection while enabling him to sweep the area he was defending with a simple circular movement. Some tobruks were protected on the top like the one shown here. 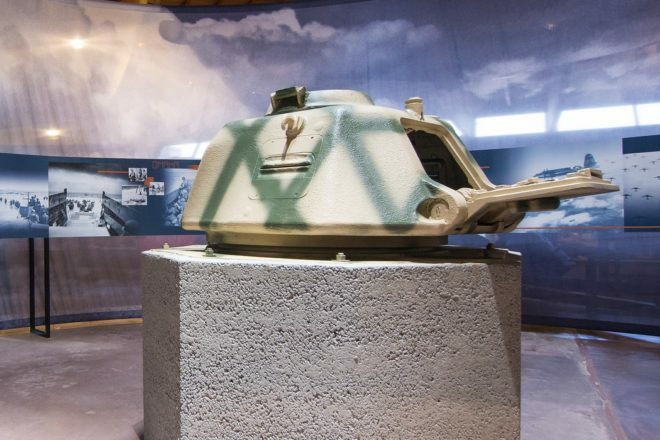 The reconstructed tobruk in the rotunda of the museum is topped by the turret of a French Renault tank captured by the Germans during or after the French campaign of May-June 1940. This section of a tobruk was found in the Cherbourg area.